As awards seasons pick up, so do the campaigns to make your film have the best chances at the Best Picture race. However, like a drunken stupor, sometimes these efforts come off as trying too hard and leave behind a trailer of ridiculous flamboyance. Join me on every other Saturday for a highlight of the failed campaigns that make this season as much about prestige as it does about train wrecks. Come for the Harvey Weinstein comments and stay for the history. It's going to be a fun time as I explore cinema's rich history of attempting to matter. Summary: As the War continues to rage, America's president struggles with continuing carnage on the battlefield as he fights with many inside his own cabinet on the decision to emancipate the slaves. Daniel Day-Lewis is an actor who has earned every ounce of praise over his career. The very idea of his name attached to a film would suggest that he's going to win an Oscar for his performance. That much is true so far for director Paul Thomas Anderson's Phantom Thread, which is the first collaboration in 10 years for the There Will Be Blood duo. It is also reported to be his farewell performance, of which gives it an added sentimental edge during this awards season, making him one of the few actors to possibly win four acting awards. Even if that wasn't the case, the film is exciting because it's his first film in five years. The previous film was where he won Oscar number three for director Steven Spielberg's Lincoln, which saw him playing Abraham Lincoln with a certain impeccable charisma. Lincoln may seem like a cut and dry period piece, but it would seem radical in comparison to other well known depictions of the 16th president. Before 2012, Lincoln was depicted in a more upbeat manner, such as the jolly Henry Fonda portrayal in Young Mr. Lincoln. As a president, he's become a figure of high regard and is widely considered one of the best. He remains a mythic figure as a result, becoming inaccessible as a human in the process. Spielberg's goal with the film was to make him human again, deconstructing the mythology to find the man as described in the thoroughly researched biography "Team of Rivals" by Doris Kearns Goodwin. He wasn't upbeat. He was a bit quiet, choosing to speak in analogies that didn't always come from initially plausible starting points. He was a hard worker, but he was a man worn down by time. It would be a hefty challenge on a story level, leaving writer Tony Kushner plenty of room to dramatize his life. More importantly was the need to make a great prestige picture with a cast capable of delivering lines worthy of a president that was so iconic. At the center was Lewis, who would deliver his typical highly anticipated work. But would it be enough to elevate the film among the rest? Spielberg's move wasn't just to highlight the work of the great method actor, but of the cultural significance of Lincoln's passage of the 13th amendment. It was a prestige picture about cooperation, and it was meant to enliven political discourse without ruffling feathers of the 2012 presidential election. While it wasn't out before the election, it still managed to seep into the public conversation no matter where it was being promoted. The easy selling point would be Lewis himself. No matter what movie he worked on, he left behind a memorable story about getting into character. The gist of Lincoln wasn't that he was playing a character, but that he WAS Abraham Lincoln. Along with the myth that Lewis initially turned it down but was later impressed by the script, various cast members claimed that they had to call him "Mr. Lincoln" and that it was disorienting to see him in character. There was a belief that he stayed in character for over three months after divulging in over 100 books, including personal letters from Lincoln that helped him understand the diction of his character. He wasn't the Lincoln of Young Mr. Lincoln. He was Abraham Lincoln of the 19th century, a pioneer of the Republican party who would end slavery with his quiet and hoarse voice. Lewis not only looked like him, but reports tried to suggest that photographs of the actor in his teens had more than a passing glance for Lincoln. Co-star Sally Field would also suggest that Lewis would text her while in character. This would be enough to get Spielberg's film attention, but the campaign was more meticulous. Besides additional focus to accuracy in set design in sound effects, Lincoln was sold as a film of certain relevance to 2012. It was the American presidential election year, and it felt like the perfect time to remind audiences of the power of a president. They have the power to make cultural changes greater than the individual. It makes sense then that the first trailer aired right after the presidential debate. It was a move that showed the parallel of politics while doing its best to be marketed as a nonpartisan story. Despite this move, there was another request. The film wouldn't be released until after the presidential election. While the film was true to its word, it didn't stop the news from doing press, such as Time Magazine's election week issue that highlighted Lincoln's personal impact on history. In a year of controversial political films (Zero Dark Thirty), Lincoln was the safe and familiar bet. Every rational person respected Abraham Lincoln as an individual, and thus made him an easy sell. Spielberg would go so far as to campaign in Washington D.C. for the film, holding a screening for any politician who would want to attend. Spielberg would also give a speech at the Gettysburg National Military Park to commemorate the 149th anniversary of the Gettysburg Address. For a film that had played with its cards close to the chest, it was raising interest by politicking like Lincoln would've. It was to be the great unifier during the Oscar season, It helped that the general praise for the film and its box office success ($273 million internationally) made it one of the biggest movies of the year. 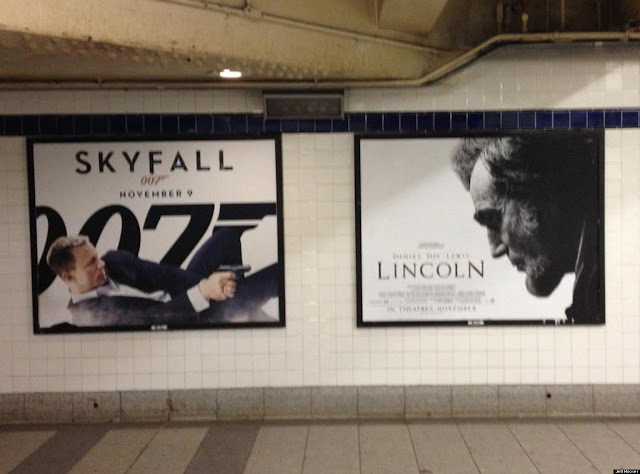 That is James Bond aiming a gun at Abraham Lincoln. To summarize history, the president died of a gunshot wound. As one could guess, this humorous positioning was in poor taste. The road to Oscar Night was paved with a lot of reassurance. It was sweeping up nominations left and right, earning even more praise for Lewis' performance. He was predicted to win Best Actor for what was considered one of his best performances ever. Beyond that, the film was praised for its accuracy and relevance to the modern political landscape. Spielberg had done his best to make the film appeal to everyone. The campaign was a big success down to how it revamped interest in the president and made him seem more human than the mythic nature that history books made him out to be. But would it be enough to work? As a later satire featuring then-president Barrack Obama would suggest, the film had legs. In one respect, the film wound up being a colossal hit at the Oscars. It would receive 12 nominations, including Best Picture, Best Director, Best Adapted Screenplay, and of course Best Actor for Lewis. Many pitted Spielberg to win Best Director, and Lewis had become a lock on the category in the awards shows leading up to that moment. Of its nominations, the oddest one was for Best Supporting Actor's Tommy Lee Jones, who was part of the five nominees that had all won at least once before. It was a rare instance in Oscar history and made the race more open (he would lose to Christoph Waltz in Django Unchained). Despite the massive nominations, the film would lose Best Picture to Argo, and Best Director to Ang Lee for Life of Pi. However, there was one thing that panned out. It was the thing that had been bet pretty smartly on: Daniel Day-Lewis himself. He could've won on The Academy's bias for actors playing historical figures. However, it was likely because of how his portrayal was sold as being the most accurate performance as well as one of the most dedicated performances of the year. It marked his third Best Actor win, which helped to set him apart from his peers. His acceptance speech, which featured a healthy dose of humor, was considered to be one of the best of the evening and lead many to suggest that he should host the ceremony the following year. The film would also go on to win Best Production Design, which made it 2 for 12 in a very competitive year. Still, it won off of the image that it was an accurate movie with attention to historical details. In that way, it was a true winner. Lewis' career has been long and storied, and it's sad to think of Phantom Thread as his farewell performance. In some ways, it's fitting that his work appears rarely but effectively like in Lincoln. However, it only means that there's more to analyze his work by than more frequent artists like James Franco or Meryl Streep. It's difficult to say how much of this potential fourth Oscar win will be bias and how much is actual talent, especially given how incredible he 2017 Best Actor category is looking to be. 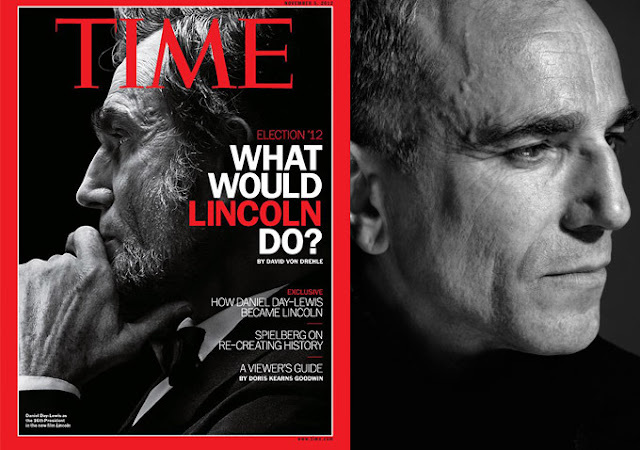 While there isn't a clear front runner yet, there's one thing for sure: Daniel Day-Lewis will be there front and center, ready to get one last go at the award that has been so kind to him in the past.